As some of you may know, I've been interested in puukkos for a while, with them probably being my all time favorite knife to make. When I started out, I looked almost exclusively at contemporary examples with the "standard" pattern of wood/birch bark sandwiched between two pieces of 1/4" brass and a blade the same width as the handle with the shoulders seated square against the handle. More recently, I've become interested in original examples from the past few centuries and have noticed that they rarely follow the general design people tend to make today. Overall, I'm wondering if anyone knows much about how the current puukko design most makers follow originated. Ones like this are pretty common, ferrule and an all wood handle with a kick at he end. I may try making a ferrule punch and die set to form them from formed/soldered sheet metal. Sometimes there is a ricasso, sometimes not, same with a small fuller. The tang goes all the way through and has a small rivet block. There are also knives with metal fittings on the top of the handle and the bottom. Sometimes they are barrel-shaped, while other times they have a decorative shape, like a horse head. 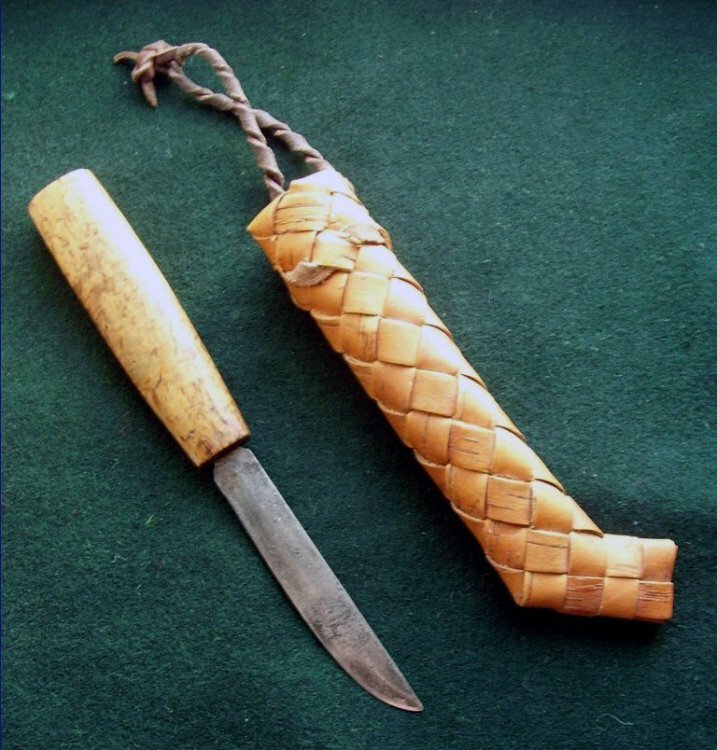 There are lots of examples with wood and birch bark, with birch bark sometimes having a metal ferrule by the blade and a block of wood to make the kick. Additionally, these knives will ocasionally have blades which are slightly wider than the bottom of the ferrule. Finally, what are probably my favorite type: the partial tang designs, often hand-made. If I'm correct the first two are maasepän and the final kokemäen. This is a style that seems to be replicated significantly by modern smiths, with a few differences. One, the shoulders in these knives often have a small gap above the handle. This could be for cleaning, sharpening, or simply not wanting to have to fit them. I've seen a few examples of modern kokemäen puukos with this feature, but few others. The biggest one is the shape of he blades. 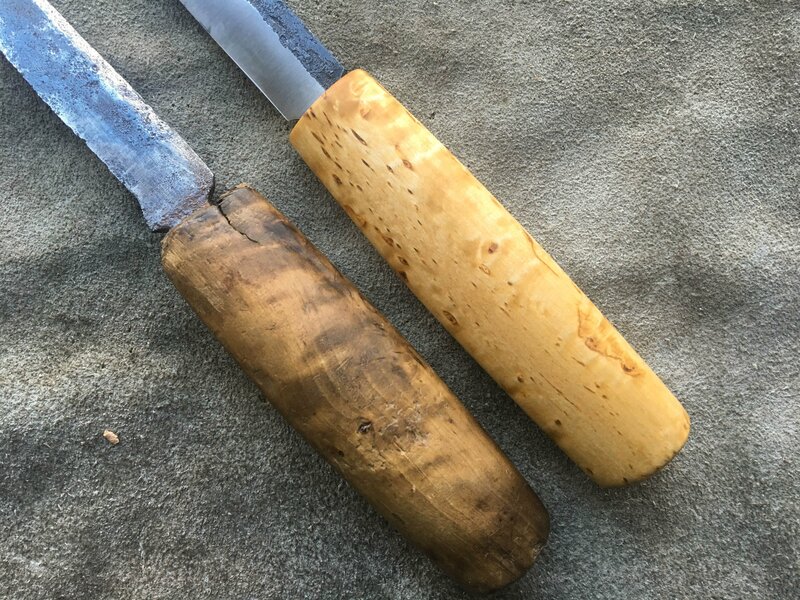 These old knives tent to have narrower, straighter, blades while modern knives have blades the same width as the handle with narrow slightly towards the tip. 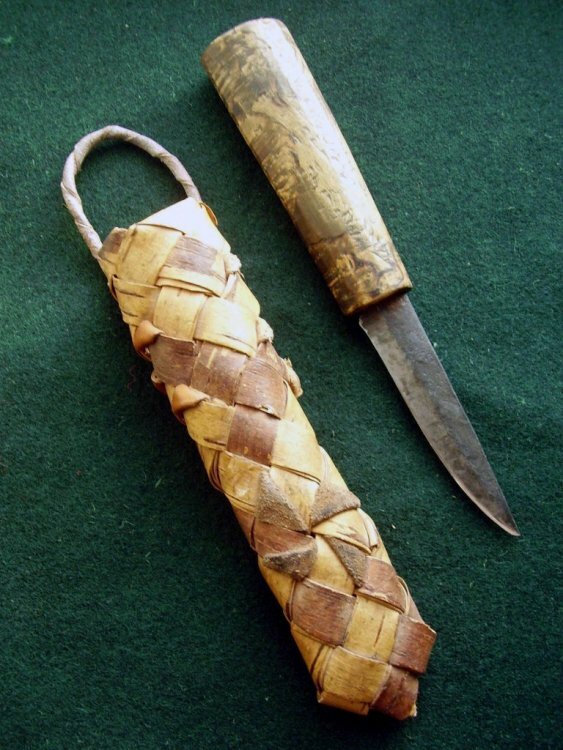 It should be noted that there are definitely other styles of knives which would be called puukkos which I haven't included, such as leukus and other knives in the Saami style. It seems like often modern versions of these knives are actually quite faithful to the originals in form, materials, and ornamentation, possibly because the knives are even more strongly tied to tradition and culture. 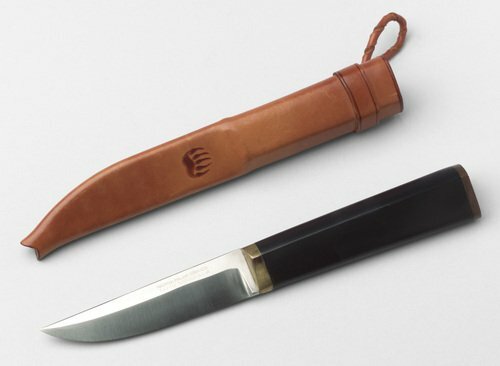 One possible answer to the question of where the "modern" puukko came from is a design by Tapio Wirkkala for Hackman Cutlery in the early 1970s, I would love to hear other people's take on that idea/if there was similar work done earlier which inspired him. Looking at the broad range of styles seen in old knives has definitely inspired me to try and make some that way (especially the old maasepän ones), and hopefully some other people might feel the same way. I love the first puukko picture, that little radius on the end of the handle is iconic. I think that the modern puukko look is possibly due to modern finishing standards/technology. I think that there is a lot less sheet metal/soldering work on modern knives, too. I love the puukkos you make, especially the maasepän ones. Do all maasepän puukkos have the 2 wedges driven in the front of then handle? 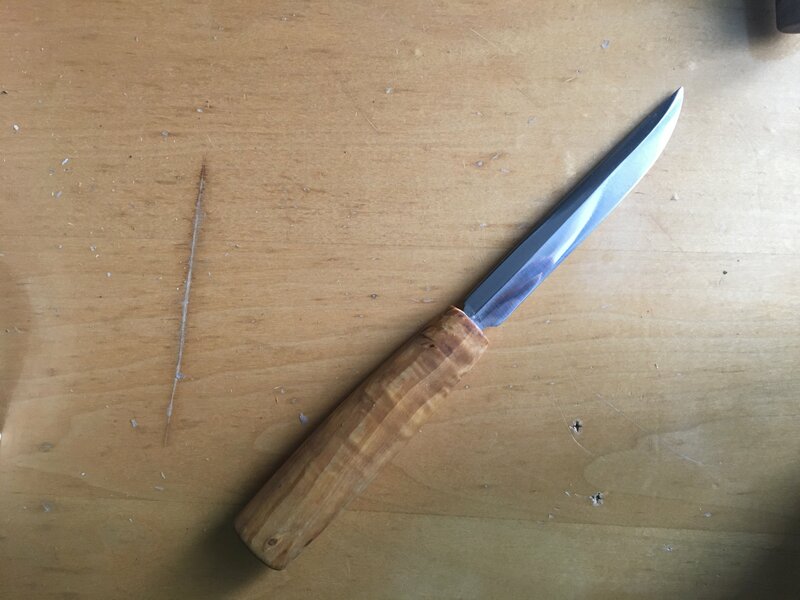 I think that the modern puukko look is possibly due to modern finishing standards/technology. I think that there is a lot less sheet metal/soldering work on modern knives, too. That would make sense. Sheet metal forming takes pretty specialized tools and thick pieces of brass are likely cheaper/easier to get now that they used to be. I was interested in the shift in style, since I’ve seen a lot of pictures of old styles, and lots from the past 10-15 years, but not much from what led from one to the next. Maybe because the old ones are antiques and the new ones were made when the Internet was prominent. Thank you! I believe wedges were only used sometimes, I’m not sure what would cause them to be used on some knives but not others. I haven’t seen very many examples of originals with this construction, but they definitely exist. As little as 3 years ago I didn't even know something like a puukko existed, but the attraction was instant. The clean lines of Scandinavian and Japanese blade is pleasing to my eye. This is my favourite, I was gifted one last year, only a small chip in the blade and the sheath has seen better days, but still a grail knife and one I didn't expect to ever own. Much as I appreciate the aesthetics I struggle to replicate it. 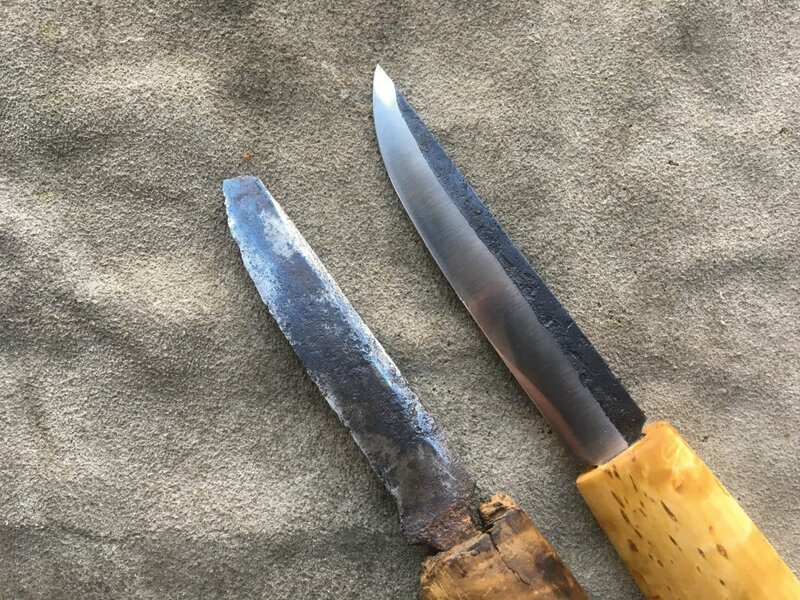 Other than the thickness of the blade and minor cosmetic details, puukkos have remained unchanged for at least 2000 years. The blade became thinner as metallurgy improved, though the edge angle remained the same, thus the modern 'scandi' grind. This example is about 1000 years old, from Norway. 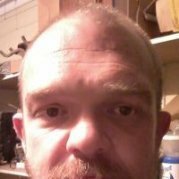 Interests:Bladesmithing,blacksmithing,indigenous blades and tools, and learning what makes things and people tick. Thank you for the picture George. The puukko is nothing more than an EDC knife from many years ago, little more than a stout paring, fish cleaning, small bird and trout, minimalist hunting and whittling knife. The Leatherman of its day. So many indigenous knives are so similar to this with small differences in local style. The exposed shoulders of many old maasepans nothing more than showing that that was as far as they could drive the blade in after burning it in and driving the pitch glued tang in. They weren't concerned about how the collector market would view their imperfections, they drove it in as far as it would go and it stuck tight and wouldn't come out and there it stayed. So many maasepans I've seen had handles that were little more than narrow potatoes or carrots in shape and the handle tang not quite all the way in, with the blade sharpened and worn away to a fragment of the original. I can just see the farmer, or herdsman asking "what for I need a new knife, this one has life in it still". 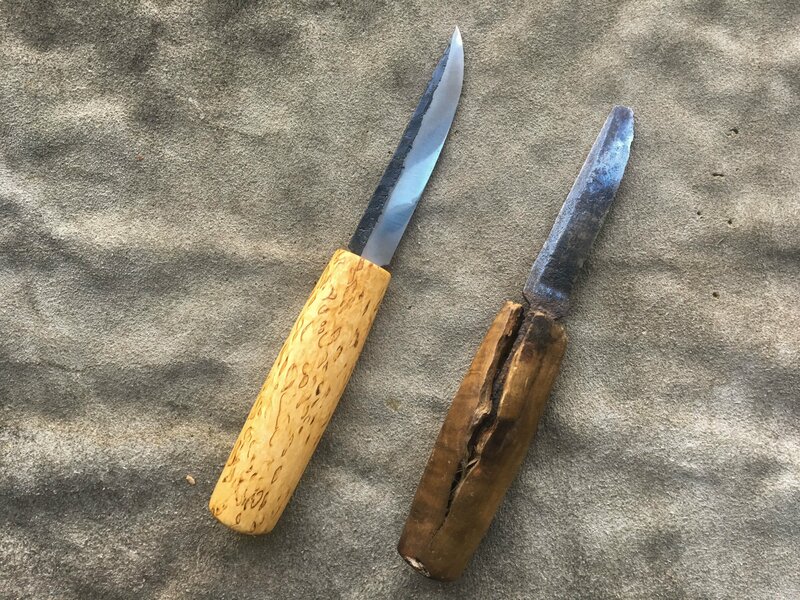 In the past many rural folks had little money for fancy knives, or a "collection", they bought blades and put their own handles on then to save money. Bolsters and horseheads and extras came after more civilization and more commerce and money and spare time were available to more than the upper class. Everyone had access to a piece of wood, it was a good blade the rural folks needed. Just my thoughts. They weren't concerned about how the collector market would view their imperfections, they drove it in as far as it would go and it stuck tight and wouldn't come out and there it stayed. Generally speaking, I think this is true of many ancient bladesmiths and blade owners. The average Joe didn't want pretty, they wanted functional. The modern preoccupation with "fit and finish" is just that, a modern preoccupation. Wow, totally missed these replies! That's a really cool knife. It's interesting how sharp the front edge of the handle is. I've seen that on a few other old knives, but its cool that it goes back so far. I have a knife inspired by one of the puukkos I posted pictures of I'll post pictures of when I have good light. 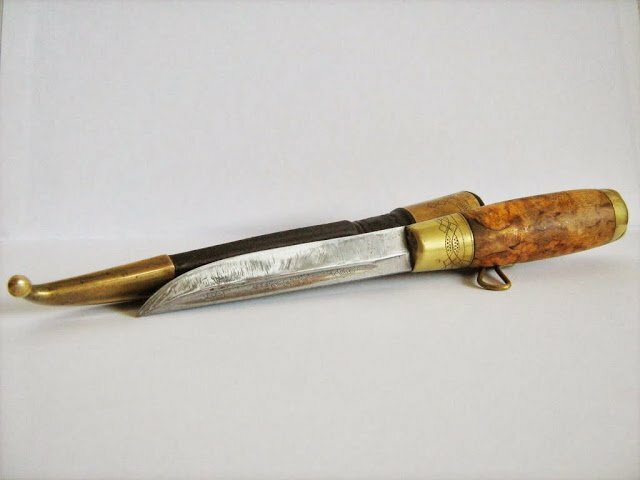 I also bought an old puukko that looks a lot like this (though not nearly as old and in similar shape), that I hope to make a replica of. It's true that a lot of old knives have relatively poor fit and finish by modern standards, but there are definitely examples of knives where both are excellent going back a long ways. Certainly true. I remember going to the San Antonio ABS knife show a few years back. There was one maker there who specialized in Japanese style kitchen knives. Every one of his blades had the shoulders out of the handle. When I asked him about it he told me that was "expected" from the folks who bought his knives as a sign of "quality". At the time, I thought to myself, "rubbish", but who knows? I have made a few knives with no pins and the blade pressed in all the way, once they come loose it happens a lot, when youre chopping at least. I guess the extra gap is extra tightening should you ever need it. If you dont like it it could be hidden with a ferrule that extends a bit past the handle and over the shoulders. a press fit blade should have a ferrule anyways, you can crack the handle of any sized knife from chopping or carving too hard especially if the blade is loose in the handle. I would tell people the gap is there so you can tighted the handle in the future. when you arent expecting a gap, a gap is not the expected quality. Yes, this is something that others have brought up. The only trouble I have with this explanation is its self-fulfilling nature. You make the knife so that it will become loose and then claim that you have included this design feature "in case" it does so. you can crack the handle of any sized knife from chopping or carving too hard especially if the blade is loose in the handle. Which is another good reason to install the pin through the handle and tang. That pin does more than hold the handle and knife together. It also transfers the forces across the width of the handle material so they are not focused along the center line. Think of it this way: The force on the blade crosses the pivot point at the front edge of the handle. The resulting leverage puts the pressure at the tang end and the pivot point (front of handle). The pin takes that pressure and disperses it across the handle width, reducing the stresses at the tang end and the pivot point. In short, it moves the pivot point backward into the handle somewhat relieving the pressure that will crack the handle material. Adding a guard or ferrule cap at the blade/handle junction, provides a reinforced pivot point (without the pin) and reduces the cracking effect because the metal guard or ferrule protects the open end of the handle material where the crack is most likely to start. Any decent glue, will keep the blade in the handle. That’s really interesting! I had always thought of pins as being meant to deal with forces in line with the tang, but I can see how they can relieve some of the strain near the blade end of the handle when the blade is in bending as well. Also, wouldn’t really consider it a hijack, definitely an interesting conversation. The blade was an experiment in that after forging it was only made using the contact wheel on my grinder and a buffing wheel, the goal being to emulate the geometry and finish of some originals I’ve seen. The bevel and “flats” are both slightly concave, though only slightly as I ground them on a diagonal on a 10” wheel. Then I polished with two grades of scotchbrite belt and finally buffed with emery. Substantially less work than a hand polish (plus, stock removal is much faster on a wheel), and yields results that look similar to a few examples I have. Also, the sheath is coming up. I spent Saturday helping to clean up the access road and off-road race track (used by the vehicle project team I’m on and my school’s autonomous tractor team) in the woods by my college, and we ended up taking down a few small birch trees. That means I ought to have enough bark to make at least one woven sheath. Aiden CC, Good luck on your birch bark sheath. There is one good tutorial on youtube for a bark sheath. He copies an old sheath he has. 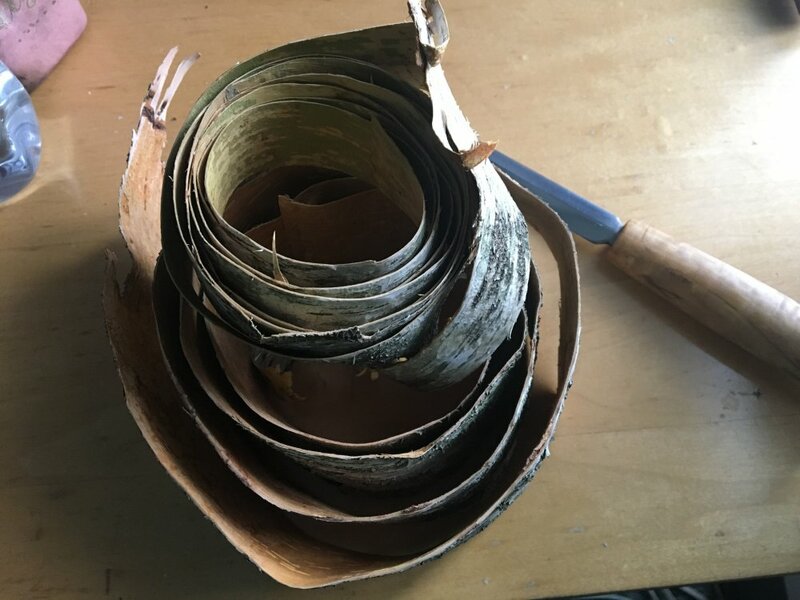 It is very good up until the end where the sheath narrows down, and he ends there without showing you how to finish the very end of the sheath. I figured out that you need to cut your strips a bit narrower there and weave them in and around the bottom. Also a heat gun is really a big help to soften and make more pliable the strips for certain areas. Heat softens the tars in the bark and helps prevent breakage, especially for tight bends, and where you are needing to slip under another strip without over stressing it. Also plan for a nice well greased leather thong the same width as your strips for your belt hanger. Also try to maintain a tight fit of all your strips as you go or you'll have big gaps between the weave later. Mine turned out real nice for my maasepan puukko with a masur birch handle, and a drill and burn in stick tang with old fashioned pitch glue. If I can ever figure how to post pics I'll post it. 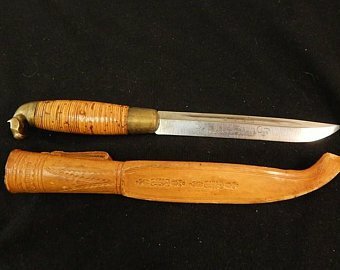 "Collectible Knives of Finland" by Lester C. Ristinen would be a good aid in answering your question. ISBN #0-9626839-1-4. Particularly the section about puukko from the Kainuun region, also known as "Tommi" puukko. Just a few points from my limited knowledged. Puukko type in first picture is very common. Mostly without fuller for what i have seen. I've had few of those. Maasepän puukkos are older. I have seen those lying around in farm my mother was born. Almost always without the sheath for some reason. I think i have seen one or two bark sheath over there. Don't know if you know this already but maasepän puukko means puukko made by village blacksmith. Like said edc made by blacksmith not bladesmith. Used for pretty much everything you can imagine. As an example i'm a tile setter and concrete floor maker (don't know the correct term for that but i hope you get the point) and i use puukkos suprisingly often in my work. I think it had two "tramatic" events; one where the tip broke off, and a second where the handle busted open and the knife was discarded (though that could just be due to rusting of the tang). It's hard to tell with the rust on the blade, but I think it was originally beveled all the way on both sides and a pseudo plunge cut was formed from sharpening. Both sides have the effect, but in slightly different places.